The map “Mean annual flow” reflects the formation patterns of the water regime of the territory, which are determined by the properties of landscapes to transform atmospheric moisture into the runoff. For a water body basin, the surface runoff is the total amount of water loss from the watershed landscapes. The runoff rate from landscape complexes is determined by solving the inverse problem, i.e. identification of the connection of flow rate at the main stream station of a catchment with the runoff from landscapes, occupying its area, and is calculated based on the equation Qj = ∑qi fij, where j is the index of the river basin, Qj is its runoff, L/s; qi is a modification of flow from the i-th landscape complex, L/s km2; fij is an area of the j-th basin occupied by the i-th landscape, km2. Long-term average runoff data for small and medium-sized rivers of theLake Baikal basin were used in calculations for the map construction [Long-term…, 1986, http://www.r-arcticnet.sr.unh.edu]. Characteristics of landscape components were obtained on the basis of the materials on landscape of the Baikal region [Landscapes…, 1977, Natural..., 2009, Landscapes…, 1990, Lysanova et al., 2009]. In accordance with the regional dimension, generalization degree is chosen at the geom level, and their average annual flow moduli are determined. The territory on the map is divided into regions according to five gradations of the module - from less than 1 to more than 10 L/s km2. The catchment area of the lake covers a variety of landscape zones and altitudinal belts, which makes a great contrast between the runoff rates. The highest annual flow moduli are formed within the goletz and mountain-taiga landscapes. Steppe and forest-steppe areas are distinguished by the minimum runoff rates, and in the desert regions of Mongolia (the Selenga river basin) flow formation almost does not take place. The maps of minimum and maximum flow were compiled based on the typological landscape classification represented on the map [Landscapes…, 1977]. In the course of investigation, landscapes of different types were generalized by identifying the most hydrologically informative properties (morphological characteristics, vegetation structure, altitudinal zonation, etc.). As a result, more than 200 landscapes were combined into sixteen types of natural complexes, and runoff rates were determined for them. The moduli of maximum snow runoff and minimum summer runoff were calculated as described above. Areas with the highest runoff of floods are confined to the mountain ranges and systems with goletz open woodlands and mountain-taiga landscapes. 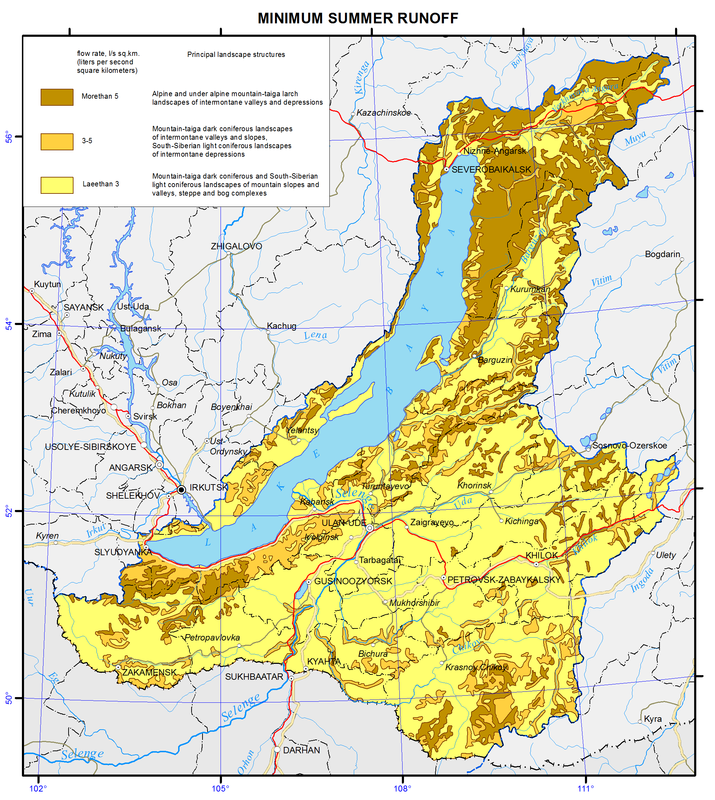 The main areas, distinguished by formation of frequent and high floods are the Baikalsky Range on the north-eastern end of the lake; Barguzinsky Range, located in the south-eastern part of the catchment, and the Khamar-Daban, covering the south-western shore of Lake Baikal. The values of the maximum flow modification are shown in three gradations on the map, namely: less than 25, 25-70, and more than 100 L/s km2. Features of formation of the minimum summer runoff in the Baikal basin are associated with the regime of atmospheric moisture, as well as with the effects of altitude and exposition. The calculations and analysis of the minimum summer runoff have shown a relatively high water yield in the low-flow period from high-mountain taiga landscapes and extremely low river flow formation in the central areas of the Selenga river catchment and in Priolkhonie, which are covered with light coniferous landscapes and steppe complexes on slopes and plains. The map shows the value of the minimum flow in three gradations, namely: less than 1.5, 3.0-5.0, and more than 5.0 L/s km2. Landscape-hydrological mapping based on the quantitative characteristics of water yield of landscape complexes objectively reflects the hydrological organization of the territory. Kuznetsova T.I. (2009). Map "Natural landscapes of the Baikal region and their use: purpose, structure, and content”. T.I. Kuznetsova, A.R. Batuev, and A.V. Bardash. Geodeziya i kartografiya, , no 9, pp. 18-28. Landscapes of southern East Siberia [Maps]: [physical map] (1977) / compiled and prep. for printing by factory no. 4 GUGK in 1976, authors: V.S. Mikheev and V.A. Ryashin. 1: 1 500 000, Moscow: GUGK, 1 map (4 sheets): col.
Landscapes [Maps] [physical map] / The National Atlas of the Mongolian People's Republic. / comp .and prep to print by GUGK in 1989, authors: B.M. Ishmuratov, K.N. Misevich, I.L. Savelyeva, et al. Lysanova, G.I., Semenov, Yu.M., Shekhovtsov, A.I., and Sorokovoy, A.A. (2013). Geosystems of the Republic of Tuva. Geografiya i prirodnye resursy, no. 3, pp. 181-185. Long-term data on the regime and surface water resources. The Baikal basin. (1986). Vol. 1, no. 14, Leningrad: Gidrometeoizdat, 361 p.